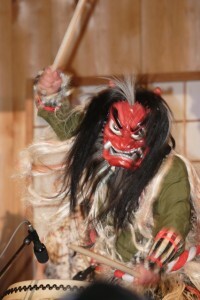 In the night of New Year’s Eve, fierce monsters called Namahage visit houses in the Oga Peninsula in [W:Akita Prefecture]. With a big kitchen knife in his hand, Namahage roars and shouta “any misbehaving kids live here?” and terrorize the children in the house. They tell children not to be lazy or cry (which is impossible when they are facing this scary monster though). 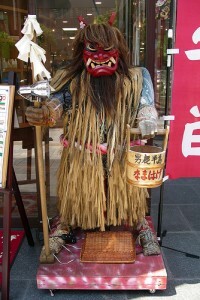 After Namahage find no bad child in the house, they are given sake and food. It’s originally a ritual for cleansing people’s souls, and for blessing the New Year, and also to encourage young children to obey their parents and to behave.